Ultrasonic Viscosity Meter:Fuji Ultrasonic Engineering Co.,Ltd. Ultrasonic applied product : Design, Production, and Sales : Fuji Ultrasonic Engineering Co.,Ltd. FUV-1 is able to measure liquid viscosity accurately by viblation principle. 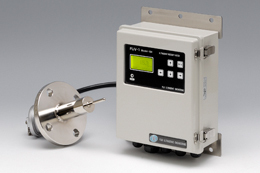 It features many technologies for ln-line viscosity measurement. Also,explosion proof model is available. When high frequency vibration is induced in a liquid, the resulting vibration is inversely propoertaional to the mechanical resistance of the liquid. The horn of the transducer is driven to vibrate at a constant viscosity independet of liquid loads. At the same time, the loaded driven current immersed in the liquid is measured which gives the viscosity of the liquid accurately. Fuji Ultrasonic Engineering Co.,Ltd. Sales Group,Overseas Sales Section. ■Please fill in the following form. -Be sure to enter the items with "*". ■Please click [SEND] mark after your filling out. Copyright（c) FUJI ULTRASONIC ENGINEERING Co.,Ltd. All Rights Reserved.